On the flop he raised me and I put him on thew flush draw and not so much on a set. I think my re-raise is good, although I could have shoved. His call is a bit confusing. He plays a VPIP 38 so it's almost impossible to come to a clear conclusion. I continue to put him on a flush. I would be betting again. I'm fine with your line up to this point. It's sort of awkward if we get jammed on but we can make a decision at that point (probably lean toward folding). I'd bet roughly 50c so that the river jam is very easy. I like the line, but I somewhat disagree with the betting 50c on the turn, your opposition CAN'T fold there if he is on a draw, get your money in on the turn. You can still lose to a set or two pair, but you are already too invested at that point. 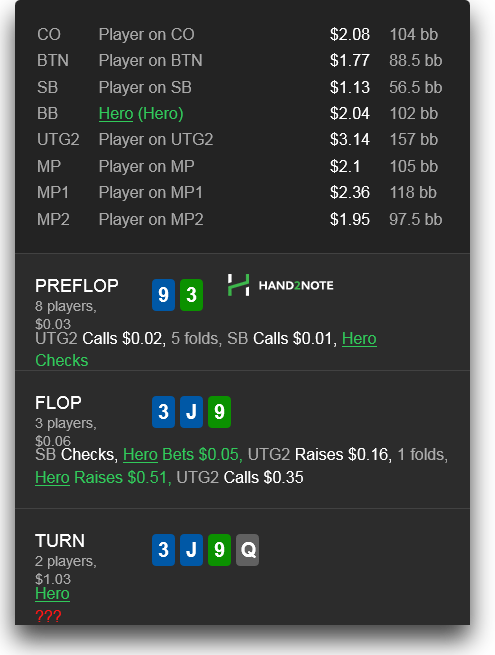 As I said above, the flop call after my re-raise is a bit confusing. From his stats I see that he is a donk, so I couldn't reliably put him on a specific range, although it is sure that he has something good. I like how you played it. I would bet 50c on the turn and call of a shove, even though you could be beat a lot, if he were able to raise a draw on the flop he could also do it on the turn (unless he had a set but that is VERY unlikely). Betting 50c will give him bad odds to call a single draw but good to call a multi draw. I don't think that matters, shoving and only getting called by better is bad in my opinion and checking giving free cards is even worse. Betting 50c will make his draws less profitable and you do have position and can check back river if the card is awful. However, I don't know how many hands you have on Vil but if you think he is bad enough to call a turn shove with bad jacks or a draw, then shoving is probably better. I like calling the flop raise and playing the turn i wouldn't 3bet the flop.You also have the 9d which also makes just calling the flop raise more appealing. We can still set up stacks at some point should we wish to on the turn or river. And we allow villain to keep bluffing or value betting with worse one pair hands. I like calling the flop raise and playing the turn i wouldn't 3bet the flop.You also have the 9d which also makes just calling the flop raise more appealing. Calling the flop raise is also a good option. "As I said above, the flop call after my re-raise is a bit confusing." I'm not sure what you think, but he would be calling with a draw, and most made hands if he puts you on draw and people just love to put you on draw because they like to call and this is a good reason to call. Most don't like to put draw in. Scourrge's advice sounds solid. "Calling the flop raise is also a good option." I don't like this at all, you need to decide on the flop if you try to get money in or not, the hand comes just monstrously hard to play if you don't do that and wrong card comes. How do people feel about "I put him on the flush draw"? While it is certainly one of the possibly holdings, we want to play well against his whole range, which includes straight draw, sets, and (with those stats) single pair hands like A9 are not impossible. It won't change how we play this spot much (I'd still bet 1/2 - 2/3 pot and jam river... How about you?) BUT it will change how hero thinks about these spots in the future, and that will be +ev if we can improve the mental processes.